Nebraska Business alumni, Kyle Larson (left) and Bob Sledge, enter the Nebraska Football Hall of Fame in 2018. Two College of Business alumni became part of Nebraska history after their induction into the Nebraska Football Hall of Fame. As two of the six members in the class, Bob Sledge ’88, and Kyle Larson ’04 can add the esteemed accomplishment to their long lists of achievements. Playing at Nebraska under legendary Coach Tom Osborne, Sledge, who earned his degree in business administration, played offensive tackle. During his time as a Cornhusker, Sledge accomplished many things, including making second-team All-Big Eight during his junior year, and first-team during his senior year. As one of the linemen, the Omaha native played a key role in helping Nebraska to an NCAA rushing title in 1988, with the team averaging 382.3 yards per game. He was an essential part of a 31-6 record produced during his three seasons at Nebraska, including appearances in the Fiesta Bowl, Orange Bowl and Sugar Bowl. Sledge and Larson both received undergraduate degrees majoring in business administration. Larson, who also studied business administration and is from Funk, Nebraska, worked his way to become one of the top punters in the program’s history. Under the coaching of Frank Solich, Larson made a name for himself on the team. 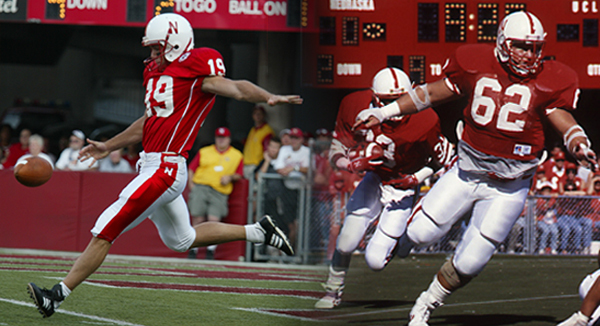 Holding the record at Nebraska for most career punts at 195, Larson earned first-team All-America honors during his senior year in 2003. During his final year as a Husker, he averaged 45.12 yards per punt, then a school record, which ranked him No. seven in the nation. He finished as one of three finalists for the Ray Guy Award in 2003, an award honoring the nation’s best collegiate punters. Larson’s success at Nebraska led to a five-year career in the NFL as the Cincinnati Bengals’ starting punter, where he averaged 42 yards over 379 career punts, including a career-best 75-yarder. Larson and Sledge will join the rest of the class and celebrate together at an induction dinner on the University of Nebraska–Lincoln campus on Friday, September 14. The class will then be introduced prior to Nebraska’s football game with Troy University at Memorial Stadium on Saturday, September 15. To read more about the Nebraska Football Hall of Fame Class of 2018, visit: https://nebraska.tv/sports/big-red-rundown/nfl-stars-highlight-nebraska-football-hall-of-fame-class-of-2018.